Chronic pain has become an international epidemic - an estimated one billion people across the world suffer every day. Dr. Mitchell Yass, author of The Pain Cure Rx, presents an alternative model of treatment that can resolve pain quickly and effectively without surgery or medication. In his more than 25 years of clinical experience, Dr. Yass has found that about 90 percent of chronic pain that is attributed to structural problems (e.g., herniated disc, stenosis, or arthritis) is actually caused by a muscular weakness or imbalance - all of which stems from the muscles' inability to respond to the forces created while performing everyday functional tasks. 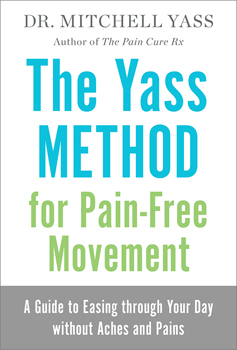 In The Yass Method for Pain-Free Movement, Dr. Yass focuses on enabling you to perform necessary and normal functional tasks without pain or discomfort. From daily life at home to work to play to travel to sleep, Dr. Yass identifies and provides easy-to-do stretches and exercises for the muscles that you need to strengthen and keep balanced for a satisfying, pain-free life.